Nokia spilled the beans about the Abu Dhabi event on October 22 – details are still scarce, but as they say a picture is worth a thousand words. The picture in question shows a phone (possibly a phablet), a tablet and a laptop. A quick peek at the rumor mill will tell you that Nokia is working on the Lumia 1520 phablet and the Lumia 2520 tablet. As for the laptop, we haven’t heard anything about a Nokia-made laptop since the Booklet in 2009. The Nokia Lumia 1520 is allegedly a phablet with a 6" 1080p screen, powered by Snapdragon 800, while the Lumia 2520 is a Windows RT tablet, also powered by Snapdragon 800 and potentially featuring a kickstand and a 1080p screen like its Surface 2 sibling. 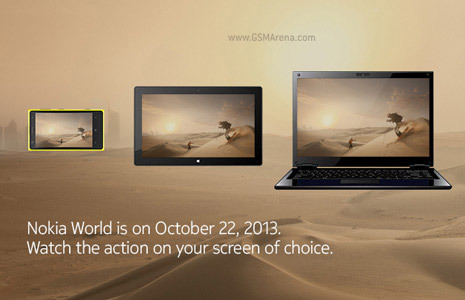 The October 22 event will be livestreamed, so check back with us in a couple of weeks for the stream and coverage. There will be additional speeches, their topic will be announced later. Stop hating bro. U know you are wrong.